France / Poland  1982  52m   Directed by: Piotr Kamler.  Starring: Michael Lonsdale.  Music by: Luc Ferrari. Chronopolis has awed me more than most any animated production I have ever seen. There is currently little information available about this and Piotr Kamler's other films. There have been showings at several festivals and events, but Kamler's work is quite difficult to find. A small company in Boston had released Chronopolis on VHS for a short while in the late 1980's or so, and I was fortunate enough to get to see a decent transfer of it. 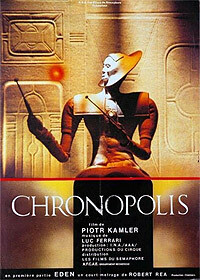 Chronopolis was a French-Polish co-production with a story by Kamler and music from Luc Ferrari of the INAGRM electroacoustic studios. The story is fascinating, and the style in which it is told remarkable. There is no dialog to explain what happens, just some brief opening narration to set the scene (I missed this, as I know little French). There is an obsessed mountain climber. And elsewhere, a city with enigmatic inhabitants who control matter. The apparently omniscient Chronopolitans are able to see this mountain climber in his world, deciding to contact him to reveal their hidden existence. To do so, they manipulate basic matter though a sort of alchemy, culminating in an intelligent sphere which departs to meet the man. The interactions between the sphere and the man are mostly jovial, but trying to meet the inhabitants of Chronopolis themselves is not so simple. The story is indeed told entirely through pictures and music. This is much a process of sharing the discoveries of the characters with them, and so does require some patience. The film might appear to move slowly to a person hoping for dialog or a more conventional film narrative, but I expect that those who can appreciate the attention to detail here will relish it. Most movies which use 3D animation use it in a more cartoonish, "claymation" effect, whereas the sculpture here tends towards a less exaggerated appearance. In many ways, the city of Chronopolis is the main character itself. How the place is depicted is a fine balance between organic fluidity and grown technology, with the larger than life grandeur of an abandoned city from a lost Earth civilization, such as those from Egypt and Central America. The Chronopolitans may appear to be a refined culture, with vast knowledge and abilities, but is their contact ultimately nothing more than a time capsule from a dead (or closed) culture? Or is this perhaps a land of mythology, with different characteristics and rules than ordinary life, where they are in a unique position to comment on our world? The amount of thought and effort which must have gone into this production is astonishing. The locations and characters are mostly realized in clay, or some other kind of 3D sculpture, augmented by some occasional illustrated details. Luc Ferrari's soundtrack is tasteful, the relatively subdued nature suiting the quiet locations and introspective tone of many scenes. The sound palette ranges from what sounds like treated minimal piano, to rhythmic concrete noises. Seeing Chronopolis makes me wonder why Kamler's animation is not more readily available for viewing, I would really love to see some of his other work. Not easy to track down, but if you are in the mood to see some thoughtful animation which is a bit different than those from, for instance, Svankmajer and Quay; then perhaps you should try to find Chronopolis. EDIT: It appears that the print I saw was the original, longer version. Kamler doesn't allow this version to be shown any longer, preferring instead a shorter version edited for less repetition. I prefer the longer version. As other reviewers have noted, this is not a spoon-fed story. It is hypnotic and repetitive, which affords it a rhythm which is more like music than narrative film. And it is definitely not, in my opinion, a children's movie! Unless your children are patient and have a taste for the esoteric. Review by x1nd0lent from the Internet Movie Database.